Say what you please about the Jester/Pfeiffer house ... might I suggest much would be forgiven by those who actually experience the house ... and not just in a passing tour. I came to Taliesin as an apprentice shortly after the house was built, at the time when Bruce's father still lived in the house with him. The house is magical and I believe functions as designed. History of architecture classes were held in the house (or the covered connecting patio or the circular terrace); parties were held there; informal gatherings; discussions and the like. It is such a unique structure; ideal for the desert climate; nicely oriented in the landscape. Standing in the living room cylinder, one cannot appreciate the view until seated. The narrow band of windows that sets above the long, curved seat perfectly frames the view and it is breathtaking - a panorama and absolutely unexpected experience, but one I never tired of. I recall that Bruce's dad remarried and moved into the Valley not long after that, so it truly became a "bachelor pad" - that worked as well for one as for 100. I have been to and mostly in over 130 of Wright's buildings. The privilege of living at both Taliesins is rare. To spend frequent time in a house like the Jester/Pfeiffer house rarer still. It certainly isn't a house for everyone, but my wife and I have often imagined what fun it would be to live in the Jester house. I think we could do it! 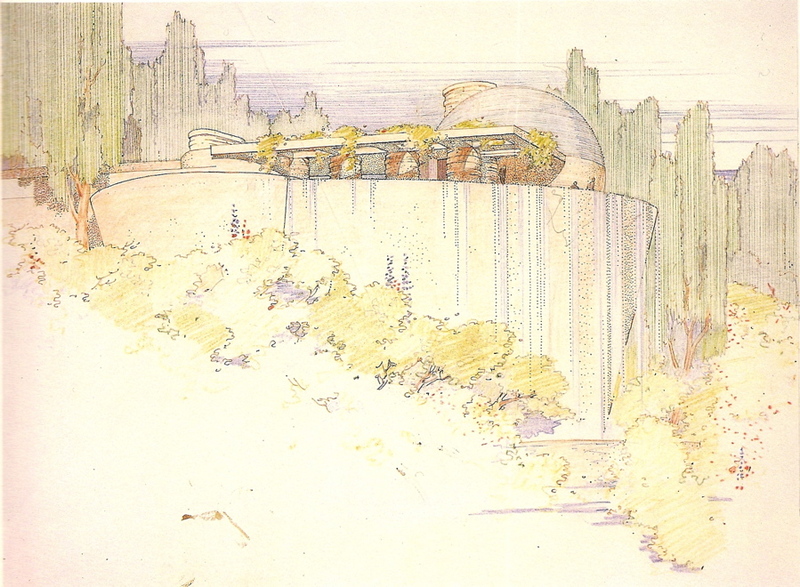 Bruce Brooks Pfeiffer, in his "Treasures of Taliesin," shows us this rendering (by Jack Howe ?) of the Huntington Hartford house. His accompanying text reveals several interesting facts, including that the house he built is owned by the Foundation. 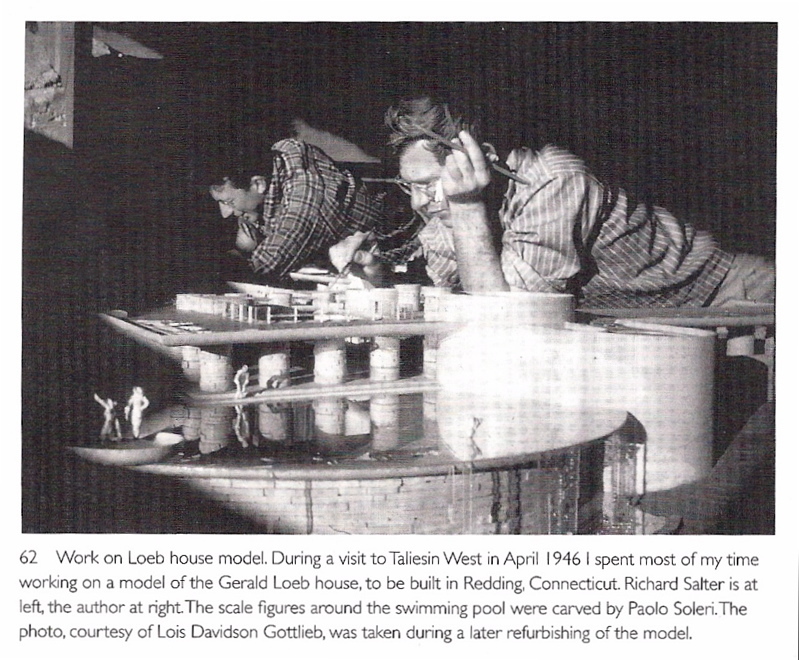 And Curtis Besinger gives us a photo showing him and R Salter working on a model of the Loeb project, another of the Jester-inspired works. 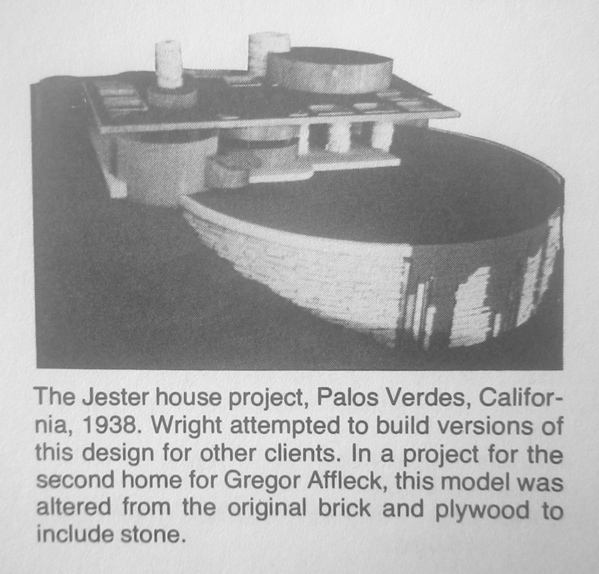 Finally, an excellent photo of the Jester/Pfeiffer house, illustrating the stark difference between the stone-and-plaster prototypes and a skin-and-bones realized house. Perhaps a more fleshed-out version -- with the rich material palette and that wonderful curved roof eave -- will yet appear, somewhere ? Or is only one "legacy" version of each design allowed ? I did not seek permission to publish Dave Anderson's delightful photo so am showing a smaller-than-usual reproduction here. In the fall of 1998, I attended a meet and greet luncheon at BBP's house and had the opportunity to experience the house longer than a typical 1/2 hour "we're walking, we're walking" house tour common to architectural sites. Though I realized the house I was experiencing was different in color, texture, and to some extent scale, than the earlier proposed versions, I kept my focus on feeling what it was like to be immersed in the environment of a house that consisted of separate enclosures gently linked by a gridded floor plane and an analogous canopy. I also took in how the circular geometry was celebrated, and not fought when it came to the furnishing and habitation of the spaces created. My experience that warm, sunny, breezy afternoon, was delightful. BBP was a most generous host, both in the opening of his house, and with the time he spent with each guest. It is easy to criticize the house for not being an exact re-creation of a scheme presented to a particular client half a century ago...no doubt there were issues we have not considered that played into the execution of the built house as we see it today. I think the house should not be viewed negatively as an altered built version of a specific unbuilt design, rather it could be seen as a built version of a design concept that truly intrigued Wright. We should be glad that it provides a chance to hapticly experience the concept. Very well put, DRN. And your thoughts and sentiments could apply to some (certainly not all) other legacy houses, too. Having done one of the 1/2 hour walk-through tour (actually, I think we ended up being there around an hour) a few years back, I can add my enjoyment of BBP's house as well. And I think it suits the site very well, indeed. All of those observations support the idea that the least important aspect of a given design is the material finishes. barest -- purest -- form ? Is the omission of the water feature significant ? For the record, I'll put these images up again. 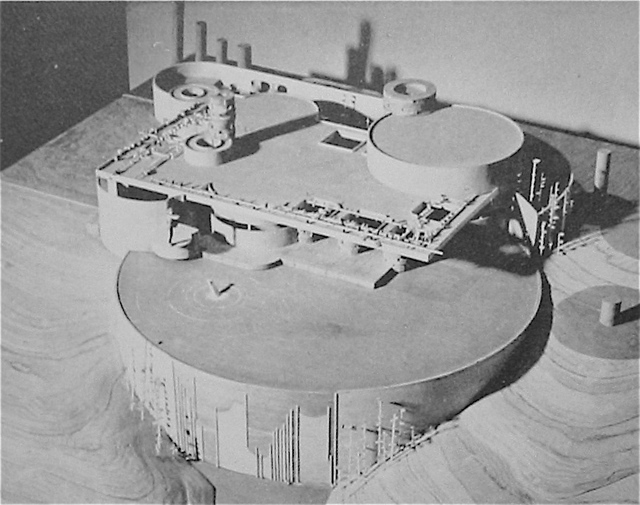 This last image and caption (as well as the plan, above) appear in Sergeant's "FLLW's Usonian Houses." The mention of brick as the "original material" is intriguing . . . I don't agree that materials are the last important part of a design. It's true that some FLW designs started out with one form of masonry and wound up with another. Such changes have some impact, but don't change the relationship between "heavy" masonry forms and "light" wood or stucco elements. And that weaving together of heavy and light is really important in much of Wright's work. IMHO. In the case of this house, the mono-material appearance really impacts the aesthetics and how the structure is "read." The roof plane, in particular, would have read "lighter" and more floating had the piers been made of masonry. A thin, upturned edge treatment would also help. This is a good example of how small design decision turn an interesting design into a clunky one. I agree, Deke; while "the reality of the building ... etc.," materials do matter a lot. Taliesin (the family quarters) and Ennis are closely related in plan layout: basically a single-loaded corridor with rooms strung along like beads on a necklace. But look at the way their different materials make them completely different houses. 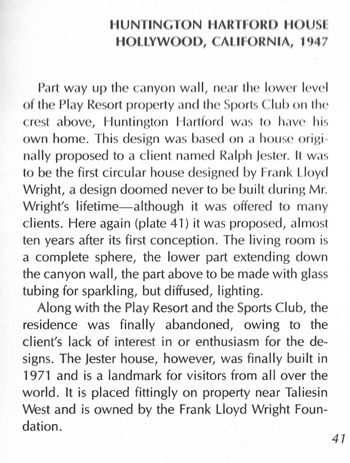 The change in vertical dimensions to accommodate Pfeiffer, Sr's height, the change from bent plywood cylinder rooms and stone columns to stucco and stucco, the change of venue ... all of it could have been done gracefully by FLW himself to meet the needs of the new client. As built, the house has its charms mostly because the original design is so strong, but it could have been better. To me, it falls a bit flat. 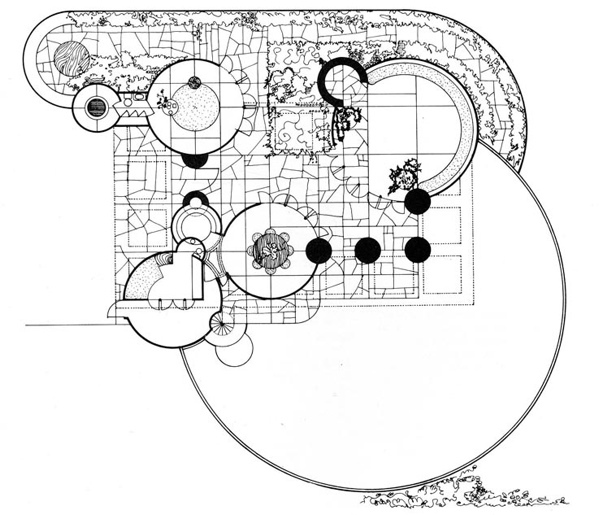 It is interesting to note the beautiful arrangement of circles on the Jester house are not random, but laid out on Wright's usual grid, most apparent on the original concept drawing. One has to wonder why a plan would be started any other way. The Jester plan drawing shows a flooring pattern that I don't recall seeing before, in Wright or elsewhere: each square in a grid is filled with random-laid stone. It's like Fallingwater meets Usonian . . . I wouldn't propose that material is the least important element in architectural composition -- would any lover of Wright's work make that claim ? Rather, it seemed possible to me that one could evaluate a work of architecture absent a material palette; one could judge spacial arrangement, play of light and shade, formal composition, leaving the colors and textures of material out of the equation. This, anyway, is how the mono-material Pfeiffer house strikes me: as a mute rendering of the Jester opus, if you will. It should be Roy Petersen, not Peterson. Petersen was a photographer for SC Johnson. The house would have been built in Racine. The Whiteford-Haddock House is by Charles Montooth. 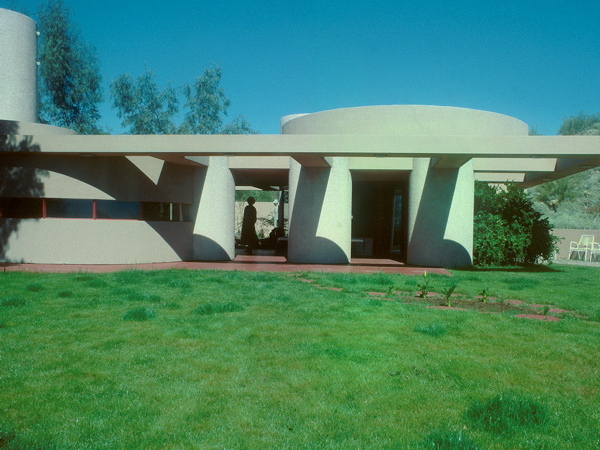 My source for stating that the Edith Carlson House is the basis for Whiteford-Haddock comes directly from someone (who wishes to remain anonymous) at Taliesin West w/ direct knowledge of the Taliesin Legacy Program. It did evolve from Carlson, but Petersen was the intermediate stop. Neither Carlson nor Petersen was built. Another difference between drawings and reality is the siting. This house, like a lot of Wright houses, begs for a sloping site from which it can project proudly. 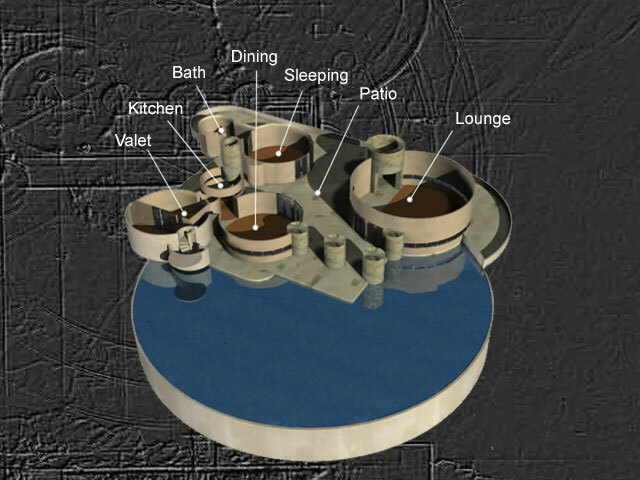 That pool is a real plinth on which the house sits. It seems the built house is on a flat chunk of land and seems cut off at the knees. The angle from which the BBP house picture was taken does not show the whole composition. The Jester circular pool is approximated by a retaining wall and parapet that defines a circular lawn in the BBP house...(traded water for grass), though there is a smaller pool with a fountain in the lawn. The retaining wall with parapet is about 6' high off the desert floor...a far cry from a vanishing edge pool at the edge of a 12' plus glen, but still it is there. The satellite setting on Google maps focused on TWest gives a good view.